← Double win for Colin Bishop!! A cold and frosty Saturday morning saw frozen parkrun courses which resembled more of an ice rink than footpaths, but undeterred by the cold snap we had a good turn out from Helsby at the various parkruns. Stand out performances belong to Joanne who was 3rd lady at Warrington and Jenny Illidge 2nd lady at Delamere. Well done ladies and well done to everyone else who attended and braved the cold conditions. A total of 137 runners took part. A total of 49 runners took part. The weather had warmed up a bit by mid-afternoon which saw the Liverpool & District cross country race at Stadt Moers with 7 Helsby vests making the journey over. A solid performance by the Helsby contingent with CBH taking the first home honours and comfortably in the top 50 and Jane Ashbrook first in for the ladies. Also congratulation to Claire Morton for running her first XC on a chilly day – we hope you’ll be back! Steve R says “great course, one of the best. I’d recommend it to anyone who fancies the return match in the Sunday League on Sunday 28th. Beginner friendly, easy to find” Well done all! Well done Colin, great result once again! Thanks for the write up Jim and well done! 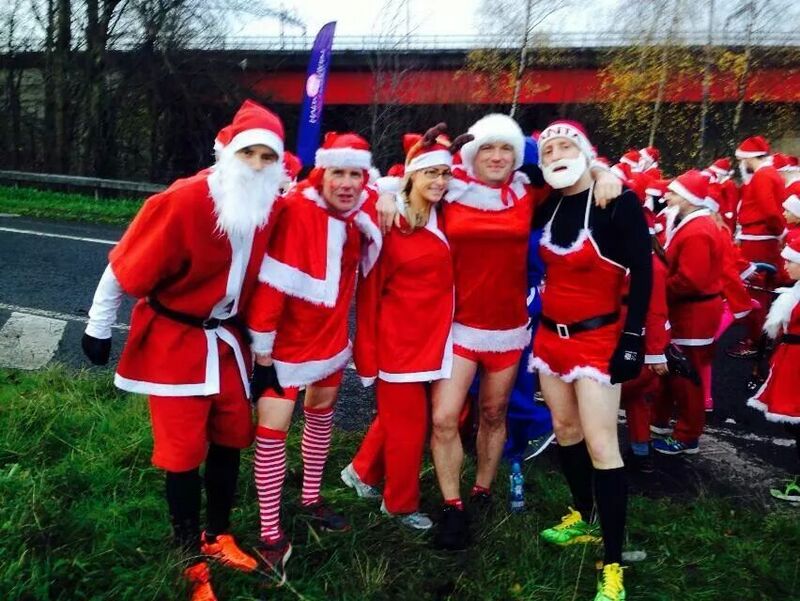 And finally to the most important race of the year – the Halton Haven santa dash! We heard that Roy had been training all year for this particular race, and came well prepared with race gels and recovery shakes (and knee high stockings!) 6 Helsby santas (5 men and a lady, or was it? It was hard to tell!) lined up for the short sprint over the Runcorn bridge, down the expressway to Astmoor and back along the busway to a finish outside the Brindley Theatre. It was a brilliant morning with Fitzy and myself crossing the finish line together to take the win (not hand in hand luckily, that’s how rumours start) Roy 4th and Joanne taking the win for the ladies. Phil Roberts and Charlie soon followed, but in a fun run like this most of us managed to repress our racing instincts, forgot about race times and just enjoyed the carnival atmosphere – plus it was hard to concentrate anyway with the amount of wolf whistles Fitzy was receiving on route! A mince pie and a pint of Guinness in the Ferry Boat topped off a fantastic morning. Also, I must add, the money raised going to an important charity at the Halton Haven Hospice. 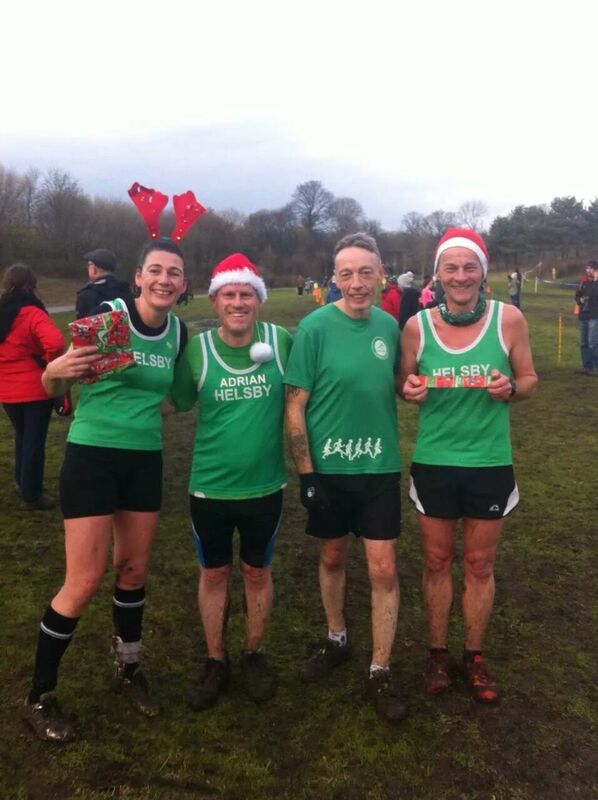 Wed 17th Dec – Christmas Club Handicap followed by a homemade soup & mince pie supper. NOTE we have three club entries for the London Marathon so please bring along your London Marathon rejection slips and we will draw for the three places this evening. That’s all this week. Enjoy the handicap on Wednesday and hopefully we’ll get a good turn out. If I have missed any results please get in touch and I’ll update the blog.